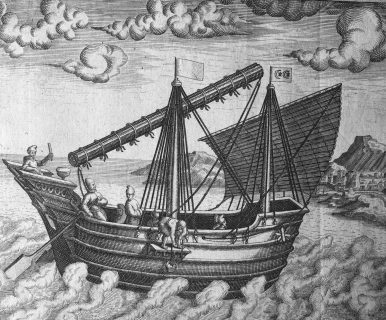 Theodore de Bry's "Navigational vessel of China" (from Latin edition of Les Grands Voyages, Frankfurt, 1602), one of the earliest Western depictions of a junk. Image Credit: From the collection of Juan José Morales. Graham Allison’s famous formula overlooks a crucial historical example: a rising Spain meeting a powerful China. George Santayana’s oft-quoted aphorism that “those who cannot remember the past are condemned to repeat it,” while undoubtedly wise, fails to provide guidance as to which past one is supposed to remember. The English-speaking West, when looking at the world that it has progressively dominated economically, politically, and culturally for more than two centuries, has had a very particular and straightforward historical narrative to explain the world it inhabits. This narrative, despite its narrowness, has in fact had considerable explanatory and predictive utility over this period. A rising-yet-not-liberalizing China is, however, an increasingly square peg in this round narrative hole: the Anglo-American narrative evidently has a problem in its data set. In coining the “Thucydides Trap” — which has emerged as the paradigm du jour for modeling Sino-American relations — Graham Allison has given a clever name to the commonsensical observation that a rising power threatening a ruling one often results in serious conflict. But the “Thucydides Trap” discussion at least has the great benefit of drawing systematically from a wider, non-exclusively anglo-centric data set ranging from the late medieval Iberian peninsula to modern Europe. But perhaps it’s still not quite wide enough for these purposes. Allison’s list of 16 case studies contains only two that involve Asia and omits the one that is arguably the most significant and directly relevant to today’s situation: that of Spain and China in the 16th and 17th centuries. China here was the ruling power and Spain the rising one, both in general and in Asia in particular. Between 1565 and 1571, Spain managed to establish itself in Manila, which was in turn made possible only by the now largely forgotten Andrés de Urdaneta’s discovery of the route back across the Pacific to the Americas, finally overcoming the uncooperative winds and currents that had stymied Spanish attempts to gain a foothold in Asia for a half-century. The result of this Western intrusion into China’s sphere of influence was not war but trade. Within a decade, there were regular commercial crossings — the so-called “Manila galleon” — that for 250 years brought the silver from the Americas that underpinned China’s money supply; goods from China and wider Asia went to Acapulco in return. People followed: Mexico had a Chinatown in the early 17th century. This Ruta de la Plata – or “Silver Way” – characterized a period when commerce between China and Spanish America formed the lynchpin of trade routes spanning four continents, linked through the medium of silver. This was no mere blip in the history of the world, for it ushered in the global economy that remains with us today. Sande tried again in another letter in 1579, as did his successor, Diego de Ronquillo, a few years later. But the suggestions seem to have fallen on entirely deaf ears. And once the Manila galleon got going in earnest, these suggestions seem never to have come up again. That is not to say, Philip II’s stated intentions notwithstanding, that relations were very friendly, or that there was not any protracted shoving. The opportunities for trade and access to raw materials did indeed occasion military action and territorial expansion, but it was the Philippines and the rest of Southeast Asia, rather than the much more powerful China, that bore the brunt of this. Spanish policy had another particular irritant: Catholicism. Without questioning the beliefs of the adherents, there was a good deal of realpolitik in pursuing the spread of religion. Actions, however one-sided, could be presented as being in the interests of the other party. There was a feeling that shared values and beliefs made it easier to do business. Converts also undermined existing hierarchies, loyalties, and structures in both occupied territories and other countries. The resulting activities were often considered less than innocent by the governments of of the region. Complaints about “interference in internal affairs” are not a uniquely modern phenomenon. One of the leading Spanish historians of the period, Manel Ollé, has summarized the development of Sino-Spanish interactions in the 16th century as an ambivalent process, intensively commercial but socially and institutionally unstable. It’s a description that looks increasingly familiar in today’s Asia. What might the past then suggest as to a 21st century containing a China returning to its status quo ante? Allison’s “Thucydides Trap” model has two settings on the output dial: war or no war. The prevailing Anglo-American historical narrative has also a limited prediction set: convergence to so-called “international norms” or unhappy alternatives based on World War II or Cold War scenarios. The “Silver Way” — admittedly a name just as made up as the “Thucydides Trap” — offers however a third possibility: continued globalization with neither convergence nor major armed conflict, where the two sides integrate but remain apart. This third possibility is not one where one side progresses while the other is held back: rather, the parties are in equilibrium, albeit an unstable one, subject to disruption, changes in relative terms of trade, differing interests and objectives, and more than occasional misunderstandings. Labels and paradigms such as the “Thucydides Trap” or the “Silver Way” (or its predecessor, the “Silk Road”) can be used as intellectual instruments, but one should be careful not allow the paradigm to supplant reality. If the paradigm contains negative terminology, such as “trap” or “war,” there is an additional danger that actions taken to protect against the negative result will perversely make it more likely. Unstable equilibria may not be ideal, but they are certainly better than war. It would be unfortunate if this possibility were closed off by using models that cannot accommodate it in the range of possible outcomes. The coming mid-century need not look like the turn of the last century, nor, God forbid, like the mid-1900s. It might instead resemble the world’s first globalization at the turn of the 17th century: an East and West that have neither converged nor descended into uncomprehending enmity, but rather in precarious balance, simultaneously cooperating and seeking advantage. What Does a ‘Free and Open Indo-Pacific’ Actually Mean?Hey Policy Wonks, This Is How You Should Read ThucydidesGraham Allison on the 'Thucydides Trap'China, Spanish America, and the 'Birth of Globalization'The Pivot to Asia: Sustainment or Appeasement?